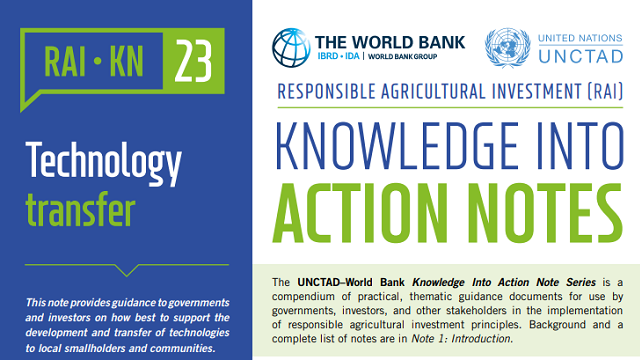 This note, part of the RAI Knowledge into Action Notes series, provides guidance to governments and investors on how best to support the development and transfer of technologies to local smallholders and communities. New technology can help boost production and productivity in the agriculture sector and, given the growing global demand forfood and fiber and the limits of natural resources, has the potential to substantially raise incomes for smallholders and rural communities. Improving mechanisms to increase the transmission and adoption of technologies is important for building technological capability in developing countries. The importation and adoption of productivity-enhancing technologies in part depends on investors’ support and training efforts but ultimately will fail if local smallholders acting as partners in the value chain do not achieve gains that warrant the embrace and use of technology.